Unicent School buses are all well maintained. 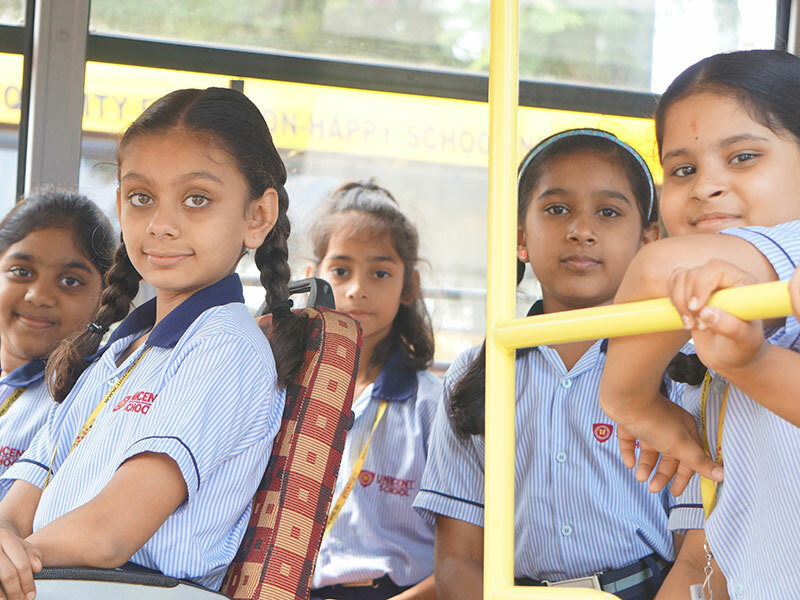 The bus service covers a distance of 15 KM around the school area ranging from Venkatapuram, Alwal, Bowenpally, Yadamma Nagar, Diary Farm Road, Suchitra, Bank Colony, Shapur, IDPL, Suraram, Chintal, Bolaram, Kowkoor, Gundlapochampally, Bahadurpally, Bhoodevi Nagar, Lothukunta, Risala Bazaar, Kompally, Maisammaguda, Qutbullapur etc. All the buses of our school, ply with a Cleaner and a lady Ayya regularly. Our drivers and cleaners receive their annual safe driver refresher training from Indian Federation of Road Safety (WWW.IFROS.ORG), apart from sessions on varied topics like Etiquette from our internal resource persons. The bus transport is being equipped with GPS.